You can find this field by clicking the 'Define New' button for a new page, or the 'Define' button for an existing page. Keep this Title short! This is not the title that goes at the top of the browser window, or in the search engine results pages. Make this Title one or two descriptive words about the content of this page. Note that the Title you give your page when you originally define it becomes the URL for the page, with dashes instead of spaces. So titling a page My Widgets makes the URL http://mysite.com/my-widgets. That URL cannot be changed once it is set. 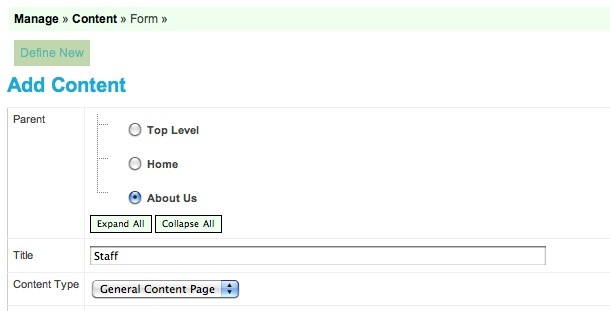 The only way to change the URL of a page is to create another page with the URL you want, copy the content of the old page into it, then delete the old page. Just remember that someone out there may have that old page's URL bookmarked or linked to from on their site. Usually this is not a very good idea for search engine purposes. One thing you can do though by changing the Title on this define screen after you've initially set and saved it, is to change the title of the page that displays in your Content tree on your management screens. Sometimes that may help you to identify the page easier on your Content screen.